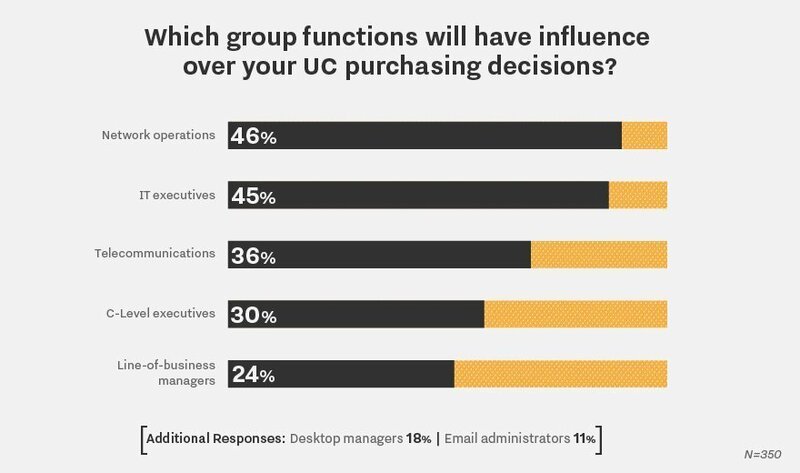 Who influences the purchase of unified communications products? TechTarget's survey results revealed the three most influential groups in the purchasing of unified communications products were network operations (cited by 46% of respondents), IT executives (45%) and telecommunications groups (36%). "The purchasing decision is more likely driven by how that business sees itself at the starting point," said Stephen Tong, Avanade's senior director of infrastructure services. For example, if a company has a depreciated IP PBX and decides it's time to upgrade its phone system, it will most likely talk to the network or telecommunications people. "If your starting point is like-for-like, 'I'm going to swap out my telephony,' that's where you're going to go." Another example is if a company's IT people look at their applications and decide to extend and unify it with unified communications products. They're going to look at it from a productivity viewpoint and probably talk to IT executives. Tong also added two additional groups that he believes can be important in UC purchasing decisions: facility groups and HR. Facility groups are those who pay for the office building for the business and look to economize and streamline the workplace, he said. They provide the infrastructure for businesses to run. "They actually end up driving a lot of decisions around productivity and unified communications," he said. The HR managers in some companies may look to redesign how their company works and provide tools for remote workers to collaborate. Line-of-business people are another group that can influence the purchase of unified communications products, he said. They generally are interested in using UC technology to talk to their customers or partners and make it easier for them to reach out for support and to collaborate. "They may be embedding UC into applications. We see that a lot," he said. What's your strategy for selling UC products?